A lot of dogs are afraid of fireworks, or can develop a fear as they age. Fireworks are now used over a longer period of time than in the past, therefore the level of anxiety can increase and traumatise your dog. If your dog suffers, the following provides examples of how you can help to relieve any anxieties and help to prevent further stress. Dogs are naturally denning animals and like to feel safe and secure. Create a den like area, which has at least two sides enclosed. For example, put a blanket over their crate if you use one, or make a den under a desk or table using blankets or sheets. If your dog has shown extreme reactions to fireworks in the past you can use a Desensitisation CD such as the CLIX Noise and Sounds CD. Do read the instructions that come with your CD. Initially you will play the CD at a VERY low level at the time of your receiving anything deemed as rewarding, such as mealtimes, interaction times with you. Slowly increase the volume over days rather than hours as long as your dog remains relaxed. IF they show increased anxiety at ANY time, reduce the volume back to the previous level and spend longer at this volume setting. You do need to be patient in doing this and do not rush increasing the volume, therefore the earlier you can start to do this before the firework season, the better. Also, do remember to play it at different times of the day so your dog does not associate a particular time with the noises. Purchase a D.A.P (Dog Appeasing Pheromone) / ADAPTIL Diffuser. It releases a synthetic pheromone, which induces a feeling of calmness and security in your dog. Plug it in near to the dogs sleeping area and leave it plugged in at all times. 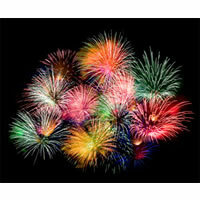 It is best to purchase and start to use one 3 or 4 weeks before fireworks are due to start. The D.A.P / ADAPTIL Collar is also a very useful addition to the diffuser. Use a natural remedy such as Dorwest Herbs Scullcap & Valerian or Dorwest Herbs Valerian Compound, which can help to calm some dogs. Ensure the environment is secure, i.e. doors are shut and cat flaps are locked/closed (and if you have a cat, that they are in the house). When the fireworks start, DO NOT punish your dog or they will associate a problem with fireworks and you will make the situation worse. However, offering plenty of physical and emotional support will help to relax them, you cannot reinforce their fears by giving cuddles, this will help to relax your dog. Draw the curtains to reduce the effect of flashes. Don’t leave your dog on their own and provide plenty of toys, chews, etc for them to keep themselves occupied. Preparing a few Kongs in readiness is a great idea, dogs love them and it gives them mental stimulation to try and get the tasty treats out. Have either your television or radio on during the worst of the evenings, the constant ‘noise’ coming from either will help to reduce the level of noise coming from outside. Don’t react to the fireworks yourself. Ensure that internal doors are not closed; doing so may cause further stress in your dog as there isn’t an exit point. Your dog must be allowed to ‘escape’ to where they feel more comfortable and stress free. An hour or so prior to darkness setting in, a meal containing carbohydrates may assist your efforts. Feeding your dog potato, rice or pasta will help to fill them up, therefore creating a sleepier feeling; this may help to relax your dog during the evening. In addition, consider purchasing a Thundershirt for your dog. This is a fantastic product that helps to reduce the immediate feeling of anxiety. The close fitting material helps to offer immediate comfort to your dog and can be worn in all situations. This may prove to be very useful with the suggested methods above. If your dog has had previous severe problems with fireworks, please contact us.